We live and breathe subscription boxes here at MSA, and we know our readers do too. This January, we surveyed YOU for your favorite boxes across a several categories, and we’re happy to finally be able to share the results! Do you find yourself wandering the aisles of the grocery store, not sure what to make for dinner this week? Maybe you find yourself ordering takeout more than you’d like, lacking the time to plan and cook healthy meals? These meal subscription services might be right for you. All of these boxes send you fresh ingredients, most have flexibility for vegetarian diets and other restrictions and allergens, and best of all: dinner can typically be on the table in 15 – 45 minutes. FYI: To make the pricing easy to compare, we’re basing the weekly price on 3 meals with 2 servings each per week, which is the most common subscription format for meal kit boxes. Nearly all companies these days also have a family plan with additional servings or meals included, and sometimes you get per plate discount! About this box: Narrowly taking the lead for first place is Hello Fresh! 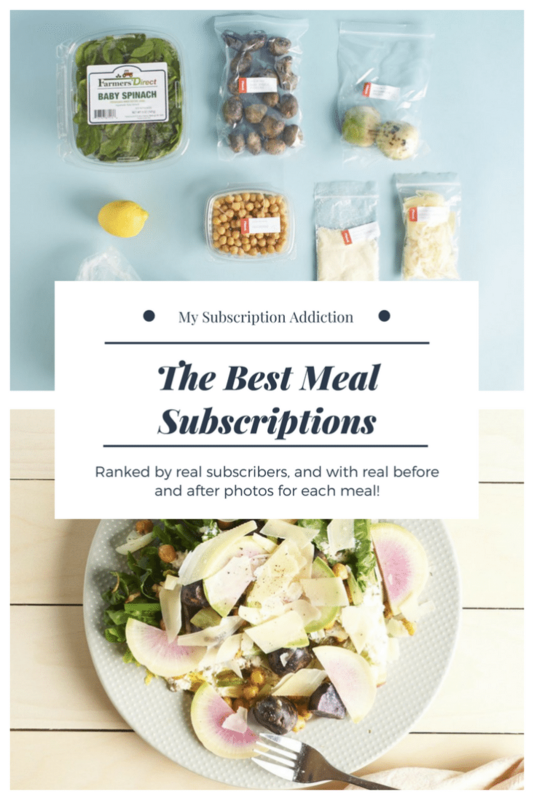 Like nearly all of the boxes in this list, Hello Fresh is a weekly meal delivery subscription that sends healthy recipes and the pre-measured ingredients you need to make them at home. Value-wise, Hello Fresh is competitively priced in the subscription meal box market: Meals start at $9.99 per serving, which is on par with Blue Apron ($9.99 per serving) and Home Chef ($9.95 per serving) and less than Plated ($12 per serving). They offer a vegetarian version as well as their standard plan and family plan (for 2 adults and 2 children). One thing we like about Hello Fresh: They package each meal’s ingredients into a convenient small bag inside the larger box, which you can easily put directly into your fridge, so there’s no searching for that single loose head of garlic come meal time! Coupon / How to buy: Use this link to save $40 on your first two boxes ($20 off the first box and $20 off the second box), no coupon required! Reviews: Check out all our Hello Fresh reviews to learn more about this dinner subscription box! About this box: In close second is Blue Apron. Every week, they send seasonal recipes created by their culinary team and all of the pre-measured ingredients you need to make them at home. In 2016, they added a wine subscription to the mix, so their recipes now come with wine pairings too. Although certain combinations of recipes aren’t allowed, they always have vegetarian options available. Similar to Hello Fresh, Blue Apron also has a family plan if you need to feed more people. Reviews: Check out all of our Blue Apron Reviews for more info! About this box: Home Chef is a subscription meal delivery service that sends a weekly box of “perfectly portioned, premium ingredients, spices & sauces, and easy, step-by-step recipes.” They allow for customization including whether you prefer to eat meat, seafood, or vegetarian; you can also indicate if you prefer to avoid, such as pork, soy, red meat, nuts, gluten, dairy, mushrooms, and shellfish. Although they have some adventurous options, there are usually comfort-food options on the menu, too. Reviews: Check out all of our Home Chef reviews to learn more about this cooking subscription box! About this box: Plated delivers a weekly box of pre-portioned fresh and seasonal ingredients, everything you need to cook their chef-designed recipes at home in your own kitchen. At least three of the dishes offered on every menu are vegetarian. Plated also regularly rotates in vegan and dairy-free options. They’re committed to using sustainably sourced seafood, seasonal produce, and meat that’s free from antibiotics and added hormones. Reviews: Check out all of our Plated Reviews for more info about this meal kit box! About this box: Although many other meal kit subscriptions strive to fill their boxes with organic produce whenever possible, Green Chef is a the only weekly subscription service on this list that is 100% organic and non-GMO. Prices range from $10.49 to $14.99 per serving, with vegetarian, omnivore, vegan, carnivore, gluten-free, and paleo options. Reviews: Check out all of our Green Chef reviews to learn more about this organic cooking subscription! About this box: SunBasket delivers fresh, seasonal ingredients to your door each week to create three unique and delicious meals created by a top San Francisco chef and approved by their nutritionist. There are 5 options you can choose from for your SunBasket plan: Chef’s Choice (3 seasonal dinner recipes), Vegetarian, Paleo, Gluten Free, and Rise and Shine (2 breakfasts and 2 dinners). Reviews: Check out all of our SunBasket reviews for more info about this box! About this box: We had an opportunity to review Gobble in 2016, and really enjoyed their angle on a meal kit box: Thanks to their fully portioned and prepped ingredients, they offer “stress-free” dinners in just 10 minutes, perfect for busy families. We were happy to learn that the meals came together as quickly as promised, and were delicious too. Gobble has a limited delivery area right now (California, Nevada, Washington, Oregon, Arizona, Idaho, and Utah), but we’re hoping they start shipping nationwide this year! Reviews: You can read our reviews here and sign up to get e-mail alerts from us when we get the news that they’re shipping to more states. About this box: Dinnerly is a newcomer to the market for 2017, with a new twist: it costs half as much as other kits, coming in around $5 per serving. They use the same quality ingredients as other meal kits, but keep the cost low by taking a simpler approach: digital recipe cards instead of paper, fewer ingredients per dish, simple packaging, and no fancy marketing campaigns. Like Gobble, Dinnerly has a limited delivery area right now (check website for details), but we’re sure with their low prices, they’ll be expanding nationwide soon. Which meal box is right for me? Did your favorite meal box make the list? Tell us about your favorite Meal & Cooking Subscription in the comments! And if you’re still looking for your perfect meal subscription box, be sure to check out our list of Book Subscription Boxes for more! I have 3 teenage boys to feed, and I have been wanted to try a meal box for a while. We decided to go with Dinnerly. The price works for me, and each meal is ready in 30 min or less with no more than 5 ingredients. At least for the summer, my boys can cook dinner while I am at work! I have been using Hello Fresh and Blue Apron for over 2 years. This is my comparison of the two services, evaluating both pros and cons. Both services are the same price for their weekly 3 recipes for 2 people. Plan for 4 people differ in price. Hello Fresh is the better deal as they offer larger entree portions for the same price; however, if Blue Apron is offering a discount, then Blue Apron is the better deal, as both services offer high quality meat and produce. Hello Fresh Pros: larger portions of main entree, e.g., chicken, fish, pork, steak. Usually 12 ozs., rarely less than 10 ozs. ; great customer service; generous compensation due to low quality produce or missing ingredient; recipes are separated and placed into individual bags; beautiful recipe cards; shorter lead time for placing next order–5 days vice 7 days; easy to use web site; easy to pause or cancel subscription via web site; easy to reach customer service through their toll free phone number. Hello Fresh Cons: Nutritional information not provided on each separate recipe card. Instead, the nutritional information for all recipes is contained on a separate card, which is easily misplaced and therefore not available when that information is needed. Blue Apron Pros: Occasionally offer discounts to clients not tied to new subscriber; Great customer service; appropriate compensation due to low quality produce or missing ingredient; beautiful recipe cards; easy to use web site; easy to pause subscription via web site. Blue Apron Cons: Smaller portions of main entree, e.g., chicken, fish, pork, steak. Usually only 10 ozs. or less. Salmon is often only 8 ozs, which is not enough to feed one man and one women; recipes often do not state how many ozs of entree like some other meal delivery svcs. ; longer lead time for placing next order–7 days vice 5 days; More difficult to cancel subscription via web site; Customer service hours are somewhat limited; Recipe ingredients are not separated, necessitating separation upon arrival; nutritional information is not on main recipe card, but instead, on a separate insert. That is so great! I just ordered my 2nd round of Blue Apron. I am a Sun Basket addict, but trying to keep checking all newest meal kits out there! Try Chef’d! Over 700 recipes and no subscriptions!!! Yummy! I read every review site I could think of and chose Home Chef based on price, number of selections, and flexibility. Some of the others make you choose between meat or vegetarian options, but Hone Chef has 10 selections each week and they include meat, fish, and vegetarian selections tailored to your taste profile that you fill out. You can even specify things like bone-in meat being okay (I love bone-in pork chops as they’re always juicier). I can get 2 meals one week, 3 the next, 4 the next – whatever suits my plans and needs. When I rate their meals they are usually. 5/5 with a couple 4s and one 3. Very impressed with this service. OOh, I’ve wanted to try Sun Basket. I found they now deliver to my area! Just signed up to get my first box next week! Oh, and I also liked how Hello Fresh how each meal was packaged inside the bigger box. However, they just changed it to a bag and that takes up more room in my fridge. I also get a half share from a CSA during the summer, so my fridge gets pretty packed. My favorite is Green Chef because they make all the sauces and cut some of the veggies so there is less time involved and less room for error. Meals are usually under 30 min unless a longer cook time. But it is the most expensive and some of the meals are “strange” so I wouldn’t recommend it on a weekly basis. SBPantry is local so they aren’t as sophisticated in their website or delivery, but I have enjoyed it too. It seems more personal. And i was very pleased with my Marley Spoon meal. I will order that again. . . and maybe if I do the survey for 2017 it will be make the list! I love Plated and don’t mind paying a bit more to have a large selection of meals each week with a lot of variety throughout the year, and their customer service is fantastic. I’ve been subscribing for almost 2 years and can’t imagine my life without it! I would like to try Gobble. I hope that they start delivering to Michigan soon. Has anyone ever tried Terra’s Kitchen? Home Chef is my favorite. Although I really like Blue Apron and Hello Fresh, I want 3 meat dishes a week and I want a huge variety of meals to choose from each week. It’s the best value for me. I loved that Green Chef had stuff already chopped up (biggest time waste for these home cooking boxes is prep aka chopping). Gobble is great for their bags of (what I call) mush. You get a meal in 10 minutes, but you also know why. Good for the kids, they love that stuff. Lacks flavor/texture, but time trade off is nice. Most of these are great options, you just got to figure out which one works best for you. I’ve tried most of the boxes listed, and I rotate between them as far as a favorite box is concerned. Right now, I think Home Chef is our favorite– mostly for the breakfasts, fruit selection, and smoothies that you can add on. And I like that with many of these if you maybe don’t feel like you can cook something THAT week but see a recipe you like, you can still look it up later on and try it while sourcing the ingredients yourself. That’s probably my biggest beef with Plated, though I appreciate Plated’s dessert offerings. I have been subscribed to Green Chef for 9 months and am very pleased. The choice of meals is perfect and customer service has been excellent. Boxes arrive as scheduled, packaged well and the recipes are well written and tasty. I have appreciated some of the recipes that I would normally not put ingredients together and they have become my favorites. Ugh…21st century….my how time flies! Lol. I am a Gobble convert. Meal boxes are quite expensive, but the fact that I can make a (usually) restaurant quality meal in under 15 minutes is a worthwhile once in a while splurge for me. Plus, I never feel hungry after these meals like I have with some other boxes I’ve tried. I love Terra’s Kitchen. They have a lot of meals with different dietary specifications. You can order meat and veggies a la carte. They even have snacks, smoothies, and salads you can order. The meal prices range from $9.99 a plate to $18.99 a plate. Everything is organic and they send everything in a reusable cube with drawers. You put it out the next business day and they pick it up. I like it better than other plans (I’ve done Plated, Hello Fresh, Bistro MD, and Blue Apron) because I can choose anything I want and as little or as much as I want. I also feel like they organize and prep everything better. It was easier for me to assemble the meals. Marley Spoon is my fave and didn’t make the list. Price-wise they are decent – $61.50 a week but the price per dish goes down even more if you order more than 3 dishes per week. My favorite meal from them was lamb merguez sausage with M’smen flatbread, yogurt, tahini, and fresh mint. I like Marley Spoon because their recipes have a bit of a European flair and their ingredients are always top of the line. I liked the M’smen so much that I now order it directly from the Hot Bread Kitchen in NY. I just recently tried Home Chef thanks to receiving a free trial and then I purchased one more week on my own. I did really like it, but I find that the food boxes are a bit expensive for only getting two meals out of it when I can go to the grocery store and buy more for my money there. I may every once in a while order a week, but I’m not keeping up with a weekly subscription. Paying for the convience and saves on impulse buying! most people rarely only buy what they went to the store to get. And gas, time and excessive waste of ingredients you buy for recipes that you don’t use an end up throwing away. So overall you really do save! just saying……. Agreed! We so save money on a food box. When I’m Off work I don’t have to do any shopping. The kids come home from school the meal and the shopping was already done for me. Bam food on the table. Take out food is expensive. Some drive-thrus you’re spending $30 with no healthy value. On a family of four that’s just economical. The food box has worked for me.